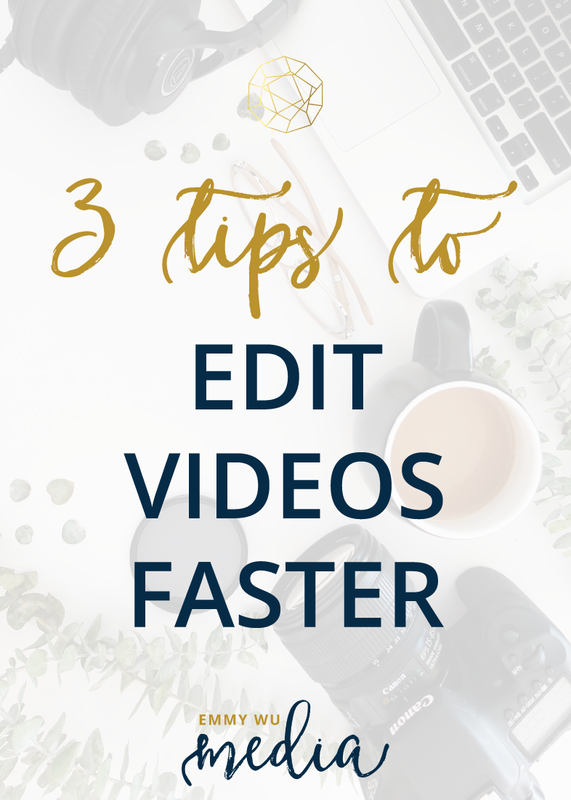 In this vlog, I want to share with you 3 tips that will help you to edit videos faster. I know that when it comes to editing, it can be a SERIOUS roadblock. There’s a lot of tech involved, stuff with frame-rates and resolution and that’s not even including the actual software itself! So, hopefully today, we’ll demystify some of the things that you need to edit well and ditch the stuff you DON’T need! The first thing that is going to be really important that is often overlooked but will definitely help you to edit faster is to plan the shoot FOR the edit. So what I mean by this is, if you, in your mind, already have a concept of what your final video will look like, you want to make sure you have those elements planned out or even included in your script so you’re not flying by the seat of your pants, recording some footage… “maybe I should do this, maybe I should talk about this instead…” because that will create a lot of confusion and disorganization and possibly overwhelm during the editing process. What this does is makes you look for a ton of different footage from different sources that might all have different file names that are recorded on different days of the week, and then it just becomes a really big mess to try and organize and find everything. If you are planning to edit your videos and you’re planning to have more than just speaking footage – maybe you want to add some b-roll in there, we want to maybe add some text elements or a cool soundtrack – most importantly, plan the b-roll shots FOR the edit. For example, for somebody who is making yoga videos, they might want the video to show them actually demonstrating the movement. But, they might not want to use a mic and be tethered down while they’re showing the actions, so in their mind, they have to plan for that. How will they plan to record the audio so it syncs up with the video? I always say, start with a script! (CHECK OUT THIS POST ABOUT SCRIPTS) I know, it’s not very glamorous. And you don’t have to plan a really elaborate script, word for word, but this really helps you formulate, in your mind, “Oh, okay, when I say this, I want this shot to appear.” It basically helps you storyboard everything in your mind before you even pick up the camera. Another example might be shooting a launch series for a client, and I’ll go through the entire script and look at the parts we can illustrate through b-roll. What are the shots we want to shoot ourselves so that it really helps to illustrate this story? So in that case, you’d plan for the shoot where you’d just go through the flow and you could sync your audio after. And that would give you an idea that you need to capture this sequence in this shot, because I know there’s going to be audio there! Or I need to say these words exactly because I know that I really want to use this type of b-roll right there to maybe open up my video or something. So just being able to plan for these things makes everything a whole lot easier. One of the things that is going to be really helpful, as well, might be what I do with my clients. We shoot all of their speaking footage usually in the morning while they’re still fresh and able to read from a teleprompter or they’re able to deliver straight to camera, but then afterward, we’ll go out and shoot the b-roll. So we would go and shoot that stuff afterward. But I’d always make a notation, like, this beach b-roll goes with this part of the video. Shopping mall b-roll goes with this part of the video. That way, when you come to import all that footage onto your computer, you have everything categorized. All your speaking footage goes in one folder. All your b-roll goes into another folder. What we do for multi-day shoots, is we do “Day 1 B-Roll” in one folder and “Day 2 B-Roll” and so on and so forth, so everything is really organized and you’re not stressed out and overwhelmed. Not even the pros can remember, and that’s why we make sure we plan for the edit! If you want to shoot a couple different segments of b-roll, like for example you have office b-roll, and then some shopping b-roll, and let’s say you also have some nature b-roll, what I’d do is put those types of b-roll into their own folders on your computer so that when you bring it into your editing software, you know what’s what. You know that it won’t get all disorganized and lumped together. Once you’ve planned the shoot for the edit, you’ll know, hey! Shopping b-roll goes here, etc. Essentially, your resolution is simply the size of your video. Pretty much all video now, is shot in high definition. You all know HD. What does that mean, though? It means it’s in the specific resolution of 1920×1080, in pixels. And that’s the resolution, the rectangular size, of an HD video. That’s all. There’s also a smaller HD video size that came out in 2005, and that was 1280×720… so you can see that the size is a little bit different. There’s also 4k and all these other old-school formats. If you live in the UK and in Europe, you’re going to be using POW, which is a different thing altogether. But here, in the US, 1920×1080 is the standard norm for HD. So this means you want to make sure you’re recording HD on your camera. If you’re using a smartphone, then it is usually by default recording in HD. PRO TIP: Make sure you’re using the back camera, not the forward-facing face camera! Do not ever use your selfie-front camera unless it’s for live video because the resolution is SUPER low. It’s a really small rectangle! So if you try and make that into a video, it’s going to look pixelated. When it comes to format, what I mean specifically is the frame rate in which you’re recording. I’m trying not to get too geeky, but originally, when film was created, it was a film reel, right? Like, a piece of film. And on each film, there was a little rectangle and each was a frame, so when they were filming, the camera would drop a little frame in front of where the light would enter the lens, and that would create a still image against that frame. It would pass through the camera at 24 frames per second. This is really geeky and you might be like, why are you talking to me about film? I have a smartphone, Emmy! But you’ll see in a second that this is all interrelated, because when you shoot on a camera that is set for 24 frames per second, or you might see it on your camera as 24 FPS, short for frames per second, it’s trying to mimic the look of film! It’s still known as the most “cinematic” look. Eventually, video came out and they shot at 30 frames per second. So more frames passing through per second. So generally, your smartphone will shoot at 30 frames per second, but if you don’t also have your editing program set at 30 frames per second, it might be editing at 24 frames per second. So what happens is your computer software is saying, okay, I’m going to edit all this footage at 24 frames per second, and you drop in the footage, and the cogs don’t fit. It’s trying to fit the frame rates into where you told it to fit but it can’t. If you’re trying to sync audio and add music, the further along you get into your video, the more lag you’ll experience. You’ll look like you’re talking, but your voice will come later or before. And it’s kind of a frustrating thing if you don’t know what you’re looking for! 99% of the time, the editing software is NOT set to the same settings as your camera! Your takeaway going forward is, anytime you go to record, make sure your camera and your editing settings match! RECOMMENDATION: I use FinalCut Pro, but it’s a higher end editing software. Although, the layout is very similar to iMovie; it just has a lot more features. For total beginners on PC, I recommend Windows Movie Maker that comes free with the newer operating systems, so start with that. …then add your elements later. What this means is, when we’re learning how to edit, we have this vision in our heads for how we want this video to look, so we pull our software up, put our footage in, and then we start to slice and dice and push things around and it’s a lot of back and forth, trying to find files and trying to add whatever in… not only is that going to slow you down, but it’ll also be frustrating if you want to make a change or you notice something later on that you want to change in the editing process, but now you’ve got all these other elements in place so trying to change things earlier in the video can be really frustrating! I think we all get caught up in this vision, instead of building on our rough cuts first. Do you rough cuts first. What do I mean by this? When you’re filming your speaking footage, most people will have several different takes or cuts. They might say something wrong the first few takes or maybe they shot it and they’re like, no, I don’t like that, so most people have several different takes in one big thing of footage. So add that into your editing software, and go through and just add your speaking footage FIRST. What I mean by this is when you’re looking for the BEST cut to add into your final timeline, just stay focused on that task. You want to make sure that all your good speaking footage goes first. End of story. You always start with a script. You start with a story. You start with YOU talking about it. I don’t know of too many videos that go by any other format. So go through your speaking footage and put the good cut into the timeline first. Don’t worry about editing or transitioning yet. Your sole footage in this first round is to get your good speaking footage into the timeline. An important tip to help you spot which ones are better clips is to use sound to help you indicate. Once you put footage into your editing timeline, you’ll often see that there are these soundwaves inside your editing software. Those soundwaves indicate the volume of your voice when you’re speaking. If you use that to your advantage, it’ll help you to speed up your edit exponentially. If I’m recording a video and I mess up on a word, I will clap really loud, twice, and so that way, when I pull the editing footage into my software, I can see where there’s a spike in the sound and I know the footage before that was really bad. I don’t have to listen to it, or watch it, or anything – I just know to cut it! TIP: In most editing software, the spacebar is play/ pause, and the keys J K and L are rewind, play, and forward. Every editing software will have its own set of shortcuts. Most companies have a PDF online of their shortcuts for their editing software. So do the first layer first. Get the rough cut in. Once you have your speaking footage in place, go in and tighten it up. Make sure there aren’t any awkward cuts. Once you’ve got all that in, you’ll go on top and add your b-roll. In editing, you have all these different layers on your timeline, and what’s on the bottom is not going to show. So if you have your speaking footage down on the bottom and your b-roll is on top, it’s only going to show your b-roll. Your audio will still come through, though! You might want to throw your soundtrack on first, before you put your b-roll in, just so that you have a nice pace and tempo to the b-roll, and finally, you’ll want to add in your elements, like text and transitions. I see so may beginner video editors trying to wrestle over transitions and such, and it’s like – no, that’s one of the FINAL things you do! Because transitions help to amplify something that’s already existing there. You’re not going to bring a totally new element into your video just with the transition. If you have any questions about faster video editing or your video editing workflow, leave a comment below!